I was very much anticipating meeting Saohin Srisuk for this interview. 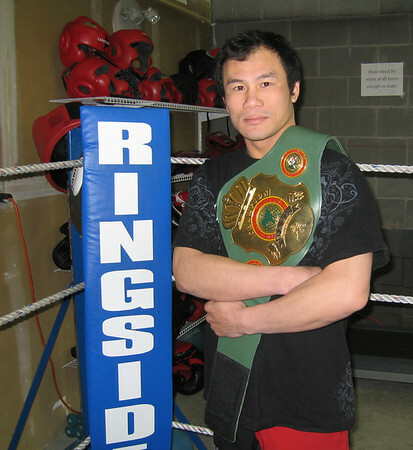 Saohin’s had a long and storied career in ringsports including Muay Thai and boxing and it took quite a long time to go through it all. 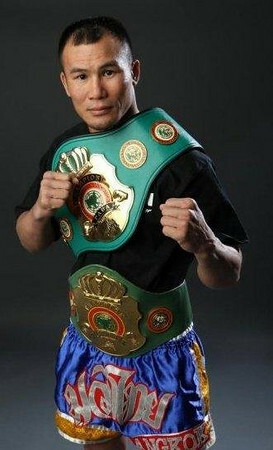 After years as a Muay Thai boxer Saohin for a long time was a contender in the world of international boxing and fought many champions. He would hold the PABA title 4 times and defend the PABA belt even more times. After being gone from Muay Thai for over a decade Saohin would return and win the S-1 title at 130lbs stopping opponents with a KO and a TKO by leg kick. Saohin since teaching at Tiger Muay Thai has focused on giving his knowledge to a new generation of Thaiboxers and MMA fighters. I want to thank Saohin for his time and patience for being so giving of his time. Hello Saohin can you tell us about yourself and how you got started in Muay Thai? Issan seems to produce a lot of strong boxers. Yes Issan and Buriram have always been a place for strong boxers. Then they move to Bangkok for training to start their careers as professional boxers. When did you switch from Muay Thai to international boxing? Who were some of your toughest fights in boxing? I think Paulie Ayala was the toughest for his strong punches. What were some of your proudest accomplishments in boxing? I was able to win the PABA (Pan Asian Boxing Association) title in two weight classes, featherweight and bantam. I also was the number one ranked contender for WBA and WBO for international boxing. Who is the boxer that influenced you most and that you admire for style? I like Oscar De la Hoya. I think he is technical and strong. You eventually would move to Phuket to train fighters at Tiger Muay Thai. How was your experience there? It was good! Ray Elbe is a very good person. At Tiger Muay Thai there are 15 Muay Thai trainers like Robert Terminator, Orono Por Muangubon, Prabat, and many other legends. How was you experience returning to Muay Thai to win the S-1 title? It was hard for me having not fought Muay Thai for a while. I would try to stay busy with my opponents and then knock them out quickly. I had to fight three times in one night! You also fought Leo ‘Amendoim’ Monterios (Leo was billed as Caga for this fight) in Bangla Stadium. How was that experience? Leo is a very strong fighter! I used clinch and punches to win on points. From Tiger you would relocate to Las Vegas, Nevada in the USA to teach students. How has that experience been? Master Toddy is a very smart businessmen and there I had a chance to work with many students in MMA to Muay Thai. In Las Vegas I would also work for Elite Fitness gym as well and made many friends. I have to also thank Steve Mazzagatti for allowing me to stay in his home for 2 weeks until I found my own place. What do you try to teach MMA students most? I focus on defense especially off the right hand. I try to make them use shorter, more explosive strikes with good techniques. I also use more elbows and clinch. How did you end up moving to Vancouver, Washington and work with Fisticuffs gym? I worked with UFC fighter George Sotripolous on Muay Thai in Las Vegas. 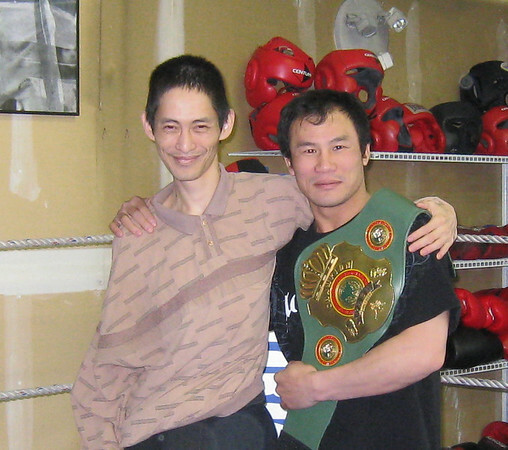 Eventually he would come to Vancouver to train so I moved as well. How has teaching at Fisticuffs gym been? It is better here. Here I am the teacher that makes the curriculum. In other places I have always worked for someone else. At Fisticuffs the Muay Thai program is all mine and I choose how classes are taught. What are some of the challenges you’ve had teaching away from home? I miss my wife Suzy the most. When the visa application was completed it was only for myself because visas are very expensive to process. My wife is in the United Kingdom but we stay in touch on the phone and internet. I have been here now for 2 weeks. Yes I like it here and want to stay. I live very close to the gym so it easy to get to in 8 minutes. I have an apartment with George here so I have people I know close too. In Las Vegas Muay Thai classes charge much more, maybe $150 but in Vancouver it is not so much. I also work with Scott Shaffer from Bellevue, Washington. Scott has fought for Japanese Muay Thai promotions like All Japan Kick Boxing. Do you enjoy working with MMA fighters? Yes. I like working with Urijah Faber and George Sotiropolous. George has improved a lot in Muay Thai. I also noticed you offer instruction in Muay Boran. How did you learn this skill? I learned Muay Boran from the Bangkok University in a program there. I have taught this style in Bellevue, Washington’s Ring Sports United gym. We teach Ling Lom and Hanuman styles. There’s been some people that would like to see you fight again. Will you fight again? No I do not want to fight any more. In my fights I have an eye injury that can be bad for fighting. I feel I have now more to offer as a teacher and coach. I have fought since I was age 13 and I am now 37. I like to teach students and show them real Muay Thai. Do you have anything coming up in Fisticuffs we can look forward to? In Vancouver there are no smokers. But I want to build up Muay Thai so I have a sparring event in June 19, 2010. Eventually maybe I will promote as well. In Vancouver I have 3 classes everyday for Muay Thai. Everyone should come and train with me! Thank you for talking to me. ~ by fatsoking on April 26, 2010. Thanks Thomas! Glad you like it! Saohin was a great interview! We had a lot of fun talking boxing! Sawadee Krub. Hello my dear friend! You are truly a Tiger. The story of your life is beautiful. Mike did a wonderful job. I really like this. It seems you are very happy. Saohin is a great coach. He as shown my 10 year old son and I the sport of mauy Thai. I am a over weight 35 year old that played football for many years I wish I knew about mauy thai when I was a kid. I love it my son loves it he is abig kid that plays football and this as helped him so much. Thank you saohin!!! Saohin is great!!! Thank you. You great, Long life, you desreve the best.